Part 10: Who can my super go to and will they pay tax? Next up: I have a basic will, is this sufficient? 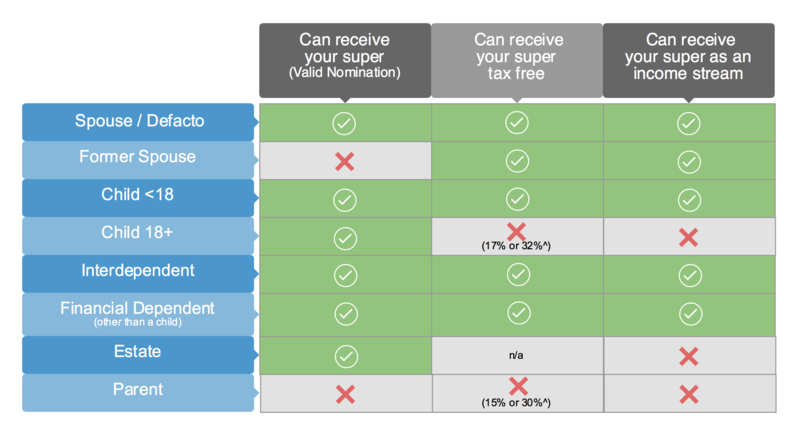 Who can receive your super and will they pay tax on it? Did you know that certain beneficiaries could receive your super as an income stream? And no, we are not just talking about reversionary beneficiaries. All the eligible beneficiaries noted above can receive your super as a lump sum. It is usually the default method of how super is transferred after death. For children above the age of 18, the lump sum is taxable at either 17% or 32% depending on the untaxed component within your super fund. Usually, the tax payable is 17% of the entire lump sum balance. IMPORTANT: If your child is over 18 and can prove financial dependence or is disabled, he or she can receive your superannuation lump sum tax-free. Some may have heard of the term ‘reversionary beneficiary’. This means that once you convert your super into pension phase (drawing an income), if you pass away, your spouse can continue to receive the income stream in her name. However, it is also important to understand the concept of Death Benefit Pensions. This means that a spouse or a child, or a financial dependent or interdependent can receive your super as an income stream after you pass away, even if your super was still in accumulation phase at the time. Only your spouse is eligible for a reversionary beneficiary. With death benefit pensions, the list is larger, as noted in the table above. Income streams may not be tax-free however. This is dependent on the age of the deceased and the age of the recipient of the income stream. If both parties were under the age of 60, then the income stream is taxable in the recipient’s name. A 15% tax offset would apply. Accordingly, the recipient could take up to $49,750 per annum tax-free once you apply the offset. IMPORTANT – Adult children over the age 18, but under the age of 25 can receive income streams. Disabled children over the age 25 can receive income streams for life. If your spouse or dependent child were to receive your super as a lump sum, it would be tax-free. However, it would exit the superannuation world. This means that your spouse or guardian for your child would have to leave those funds in a non tax friendly environment. If there are debts to repay and other goals to finalize, the lump sum option could be more viable. Opting for an income stream from super allows the funds to stay within the superannuation environment. Funds inside pension phase do not attract any earnings tax. This means that all the earnings on your fund (income and growth) will be tax-free. While there may be some tax to pay on the income stream, you will need tailored advice on your best option. As noted in the table above, parents and even siblings are not eligible to receive your superannuation. When there is an invalid beneficiary on file, distribution of funds is at the trustee’s discretion. The trustee of your super fund is simply the administrator of the fund, when speaking of public funds. Can my super to go my estate? Yes, you can nominate your estate to receive your superannuation. It will always be paid as a lump sum. From there on, the instructions in your Will determine how the funds are distributed.